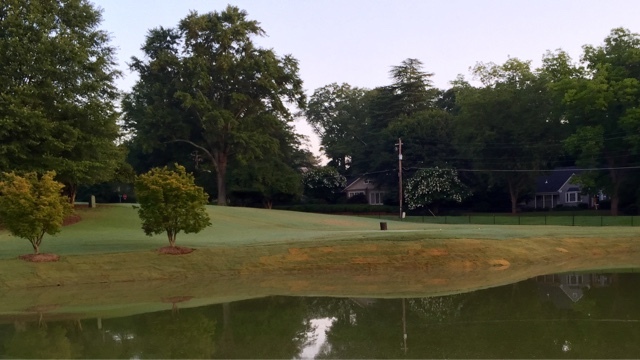 Thursday July the 9th, the golf course here at East Lake Golf Club has reopened for play following our annual summer maintenance closure. It was an extremely productive ten days. As the course heals into tournament ready conditions, we are excited for our members and guests to experience the benefits of all of our hard work. Specifically, players who frequent our facility will notice: greens that are firmer and faster, tee boxes and chipping areas that are tighter and firmer, fairways that display healthier turf growth, and uniform rough growth across all areas of the course. In Part 2 of our 3 Part series recapping our Annual Summer Maintenance we will discuss the rest of our maintenance practices from the past ten days. Saturday morning we started our verticutting processes on greens, due to multiple bouts with heavy rains we were not able to complete this process until late Monday night. In all the process required 10.5 hours of work from 12 people (126 total man hours). 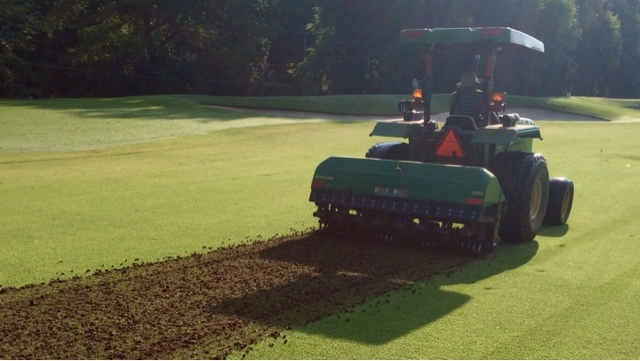 Our regular process was slightly altered due to conditions following aeration, and the depth of the verticutting. First, we had to brush the greens surface in order to smooth clumps of sand left behind the Dryject process. 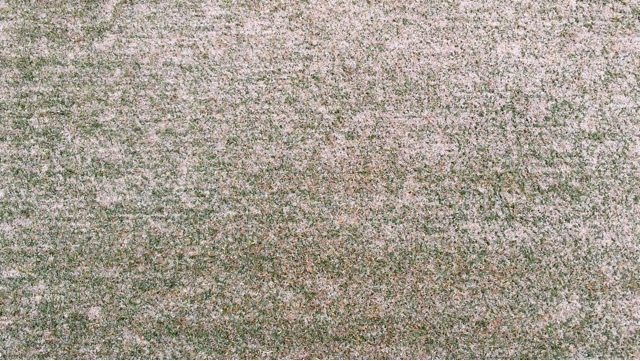 Normally, Dryject is a much cleaner process, but the increased amount of sand on the putting surface following our hollow tine aeration in combination with the constant stream of water used to clean the rollers on the Dryject machine resulted in some minor clumping of sand on the putting surface. 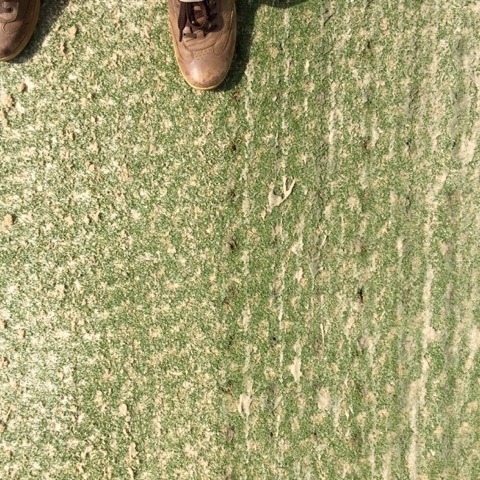 An example of putting surface conditions before (left) Dryjecting, and after (right). Additionally, a double hollow-tine aeration with 5/8" tines significantly affects the smoothness of the putting surface. Anytime maintenance is performed to the surface of the greens, we want the machine to contour to the surface with extreme accuracy. To accomplish this we brushed (to smooth the sand) then rolled (to smooth the surface) the greens before the verticutting process began. This double rolling accounted for the 6th and 7th roll performed on the greens post aeration. Next, we began the verticutting process. For this process, Howard and Chris set our verticutting blades at .200" below roller height (or .2" deep into the green). This depth allows us to aggressively remove dead grass deposits which soften the putting surface. Additionally, this process forces the Bermudagrass to grow in an upright, neutral position (reducing the effects of grain) and creates new growing points where stolons were once connected. Everytime we verticut greens we backtrack, two directions, downhill first, meaning we always make our first pass downhill in a specified direction, then the second pass is made on the same line uphill. This is done until the entire green has been completed, then a second predetermined direction is preformed in the same manner until completed. The second direction creates a 45 degree angle from the first direction. We find that this 45 degree angle greatly minimizes the affect on ball roll durring the healing process. Normally, both directions of the verticutting are completed before the sweep-n-fill brushes remove the organic matter from the green. 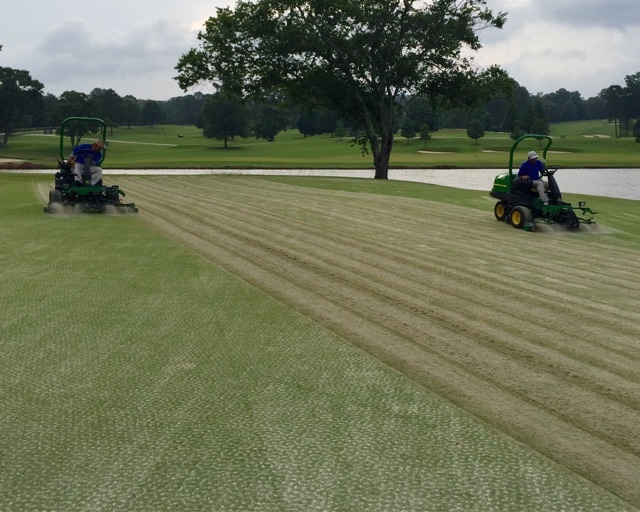 For this specific application, the depth of the verticutter blades were removing so much organic matter, we felt that the sweep-n-fills needed to be used after the completion of each verticut direction. The amount of organic matter being removed was so great that we had a team member use a back pack blower to remove additional organic matter which spilled out of the side of the sweep-n-fill. Sweep-n-Fill on putting greens. Uphill only, same direction as verticutters. Look at all of that organic matter being removed! Once each direction of the verticut and sweep-n-fill were completed, a buffalo blower was used to again remove any remaining organic matter on the surface of the green. 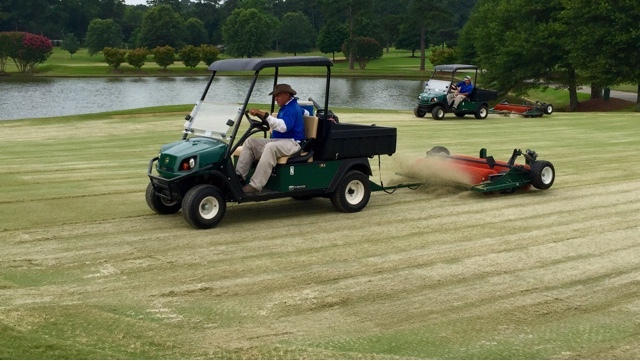 Because organic matter is less dense than sand by nature, a blower at an almost horizontal orientation does a great job of picking up and moving the organically while leaving the sand in place. Putting surface condition post sweep-n-fill, pre-mow. Lastly, a backtrack mow was performed at regular mowing height. Needless to say, much sand passes through our reels during this mow, and thus we choose to not use buckets to catch what clippings are cut. Following the backtrack mow, the buffalo blower made a pass across the green, again to remove organic matter. You might be picking up on a theme here.......... REMOVE ORGANIC MATTER!!!!! As compared to our green's processes, bunker perfection is very simple: remove any bermudagrass runners in the sand, fix any bunker liner abrasions, and check to ensure that we have 2" of sand on the face of the bunker and 4" of sand in the bottom. When significant rain is expected soon after this process we will also use a plate tamp to compact the sand on the faces of the bunkers. 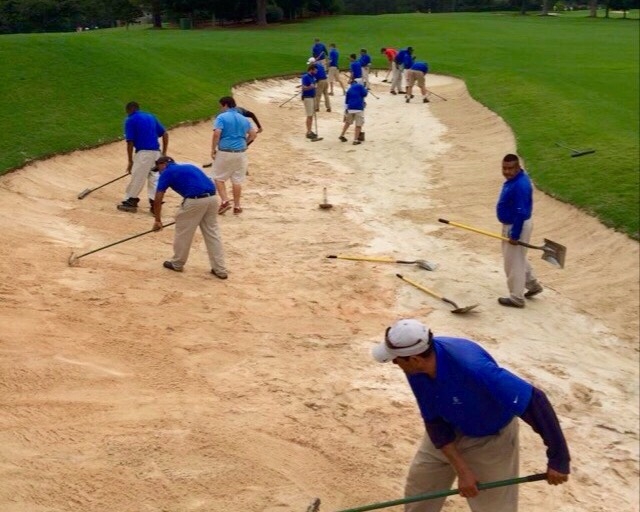 We have found that if the sand does not have time to settle, we are more prone to bunker washes when it rains. Our rough aeration process was completed similarly to our fairway aeration. We used a John Deere Aerocore2000 mounted with 3/4 side-eject hollow tines. The hole spacing was 3"x3". This year we aerated three passes around the fairways, the walk paths from tee to fairway, and also some of the green's surround rough. Next, we allowed the plugs to dry and reincorporated the soil back into the subsurface. 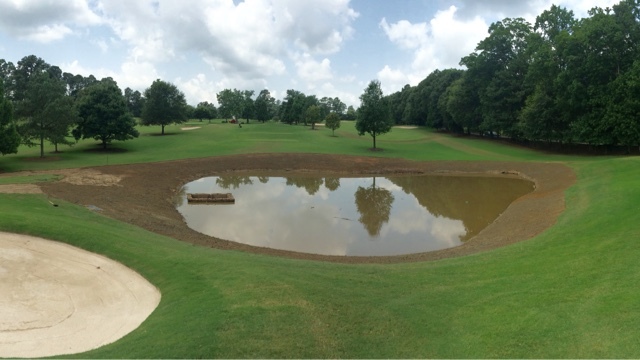 Our lake renovation iniative has been a huge success! 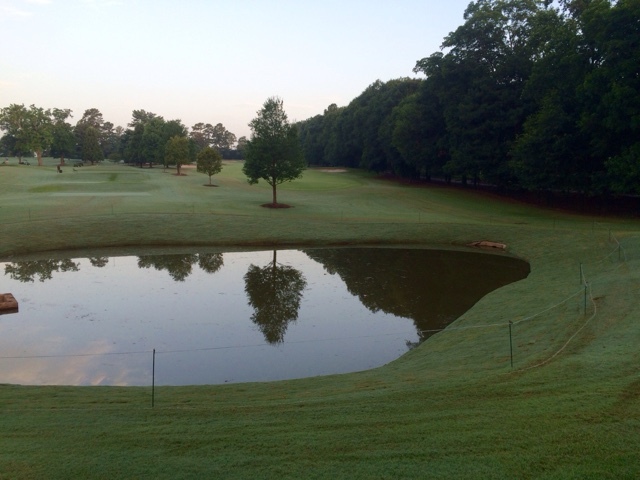 From an engineering perspective, the purpose of the lake in front of #2 green is to contain any silt deposits that come on to our property through the stream which feeds it. It has certain been effective! Previous to the dredging, the center of the lake was only inches deep, now it is twelve feet deep! 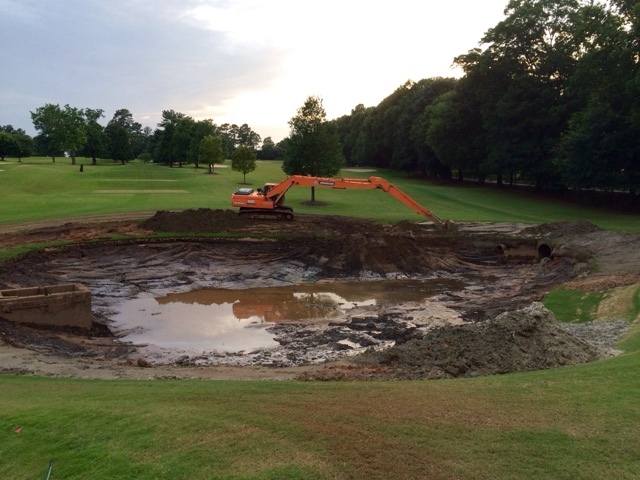 In all, nearly 5000 cubic yards of material were removed. In addition to the dredging, we took this opportunity to reshape the banks surrounding the #2 lake. It now has a very aesthetically pleasing look, which will also be easier to maintain. Number two shaped and ready for sod. The lake banks on #10 had slowly eroded through the years due to animal inhabitants, and normal weathering. Parts of the bank had become very difficult to maintain, and were not aesthetically up to par. 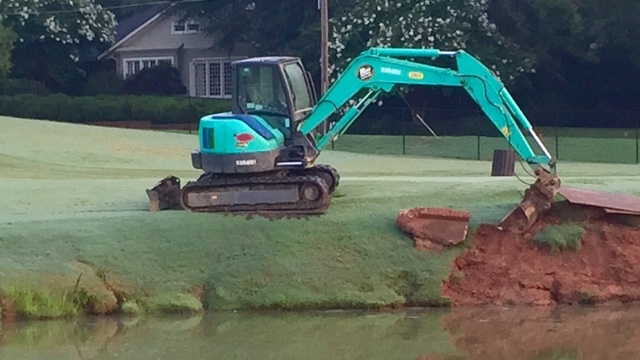 Medalist's expert shaper made quick work of molding the new contours of the lake bank. 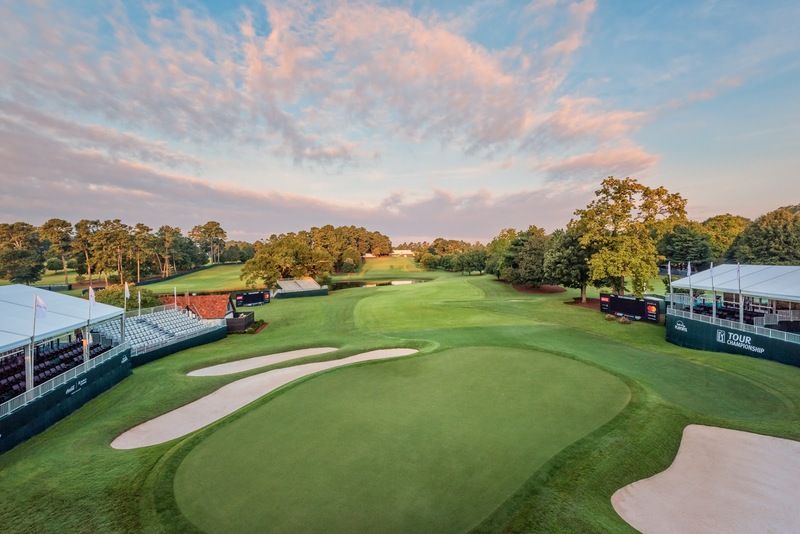 Historically, #10 and #18 get a tremendous amount of foot traffic during The Tour Championship, this year we are excited to present this upgrade to all of our patrons. Number ten tee here, with an example of some of the previous conditions on the left, scraping and shaping on the right. Number ten completed! Looks great!